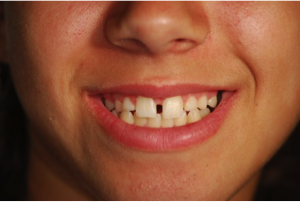 This fifteen-year old native Bethesda/Chevy-Chase patient was referred to us by her Orthodontist and General Dentist. 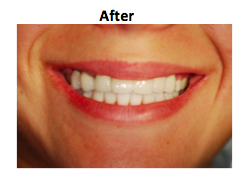 By using implants to replace her congenitally missing teeth, the patient’s smile would be remarkably transformed. Even though she was in the middle of orthodontic therapy, we were called upon to provide guidance on the tooth positioning so that there would be adequate spacing for the future implant placement. 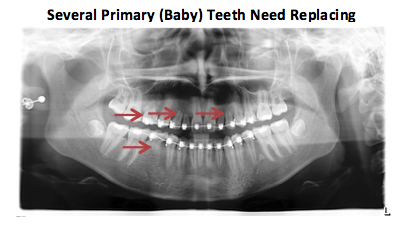 Implants should not be placed in children until they have stopped growing. Therefore, we have established eighteen years old as our minimal benchmark for implant placement. In order to provide the right arch form and bony architecture, we assembled a team consisting of the patient’s existing Orthodontist, an Oral Surgeon to reset the jaws into the ideal occlusion (bite), a Periodontist for bone grafting the sites of missing teeth, and an endodontist for necessary root canal therapy. We assembled this precision team of practitioners to ensure that we attained the ideal results before we placed the implants, their abutments, and the final crowns. 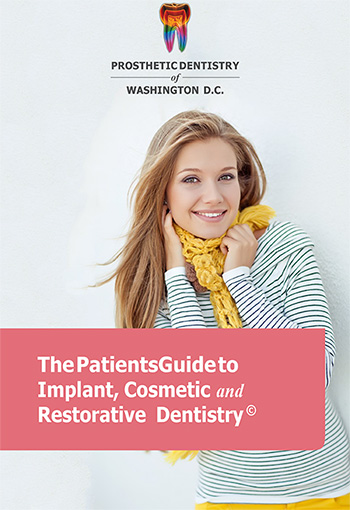 Once the implants had fused to the bone, we inserted custom abutments and final crowns. The patient now has a complete dentition and a great look, and she is so thrilled by the results that she is considering going to dental school.